This volume celebrates and evaluates Anthony D. Smith’s path-breaking contribution to the study of nations and nationalism. 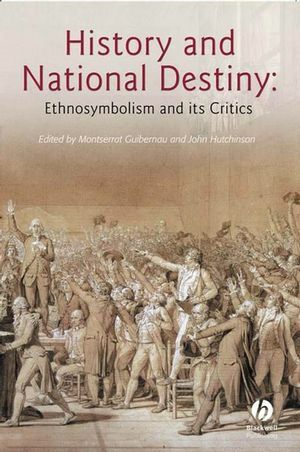 A fresh and critical look at Anthony D. Smith’s path-breaking contribution to the study of nations and nationalism. Debates various issues concerning Smith’s controversial ethnosymbolic approach. Includes contributions from academics based in the Czech Republic, Norway, the UK and US. Opens up new avenues of research. Montserrat Guibernau is Reader in Politics at the Open University and holds a Leverhulme Trust Fellowship. She has previously taught at the universities of Cambridge, Warwick and Barcelona. Her publications include, Nationalisms (Polity, 1996), The Ethnicity Reader (with J. Rex, Polity, 1997), Nations without States (Polity, 1999), Governing European Diversity (2001), Understanding Nationalism (with J. Hutchinson, Polity, 2001) and The Accommodation of National Minorities in Democratic Plural Societies (with A. Gagnon and F. Rocher, 2003). John Hutchinson is Senior Lecturer in Nationalism in Europe in the Department of Government, London School of Economics and Political Science. His key interests are cultural nationalism, Irish nationalism, theories of nationalism, warfare and national identity. Introduction: History and National Destiny: Monterrey Guibernau (Open University) and John Hutchinson (London School of Economics). 1. Definitions, Periodization and Prospects for the Longue Duree: John A. Armstrong (retired from University of Wisconsin, Madison). 2. Covenant and Continuity: Ethno-Symbolism and the Myth of Divine Election: Bruce Cauthen. 3. The Timelessness of Nations: Walker Connor (Middlebury College). 4. Place, Kinship and the Case for Non-Ethnic Nations: Thomas Hylland Eriksen (University of Oslo). 5. ‘Dominant Ethnicity’ and the ‘Ethnic-Civic’ Dichotomy in the Work of A. D. Smith: Eric Kaufmann (Birkbeck College, University of London) and Oliver Zimmer (University of Durham). 6. Ethnicity and Supra-Ethnicity in Corpus Planning: The Hidden Status Agenda in Corpus Planning: Joshua A. Fishman (Yeshiva University, New York). 7. From Ethnic Group Toward the Modern Nation: The Czech Case: Miroslav Hroch (Charles University Prague). 8. Myth Against Myth: The Nation as Ethnic Overlay: John Hutchinson (London School of Economics). 9. Anthony D. Smith on Nations and National Identity: A Critical Assessment: Montserrat Guibernau (Open University). 10. The Ethno-Cultural Roots of National Art: Athena S. Leoussi (University of Reading). 11. Nationalism and Globalisation: Mary Kaldor. 12. Globalising National States: Stein Tønnesson (historian). 13. History and National Destiny: Responses and Clarifications: Anthony D. Smith (London School of Economics).